TWIN OVER TWIN BUNKS: Two beds in the space of one provide an extra sleepover bed for your child, or beds for two children sharing a room! WOODGRAIN VENEER: Brooklyn Oak and White veneer finishes add a natural look, and protect against scratches, stains, and fading from UV rays. STENCILLED LETTERING ACCENT: White stenciled lettering adds a fun element to the design of these industrial-style bunk beds. 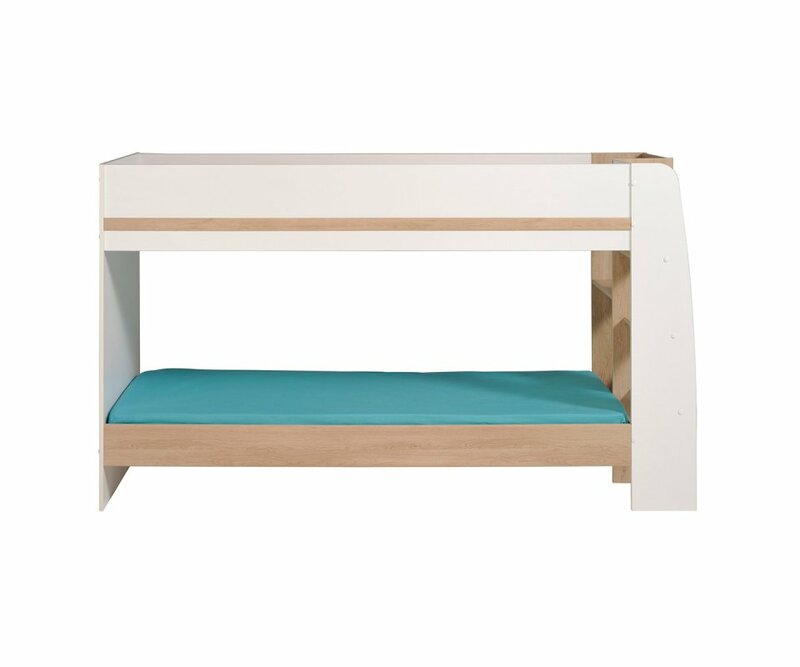 SAFETY FEATURES: There are built-in flat steps to the top bunk, which is encased with a safety rail on all sides to ensure your child’s safety. 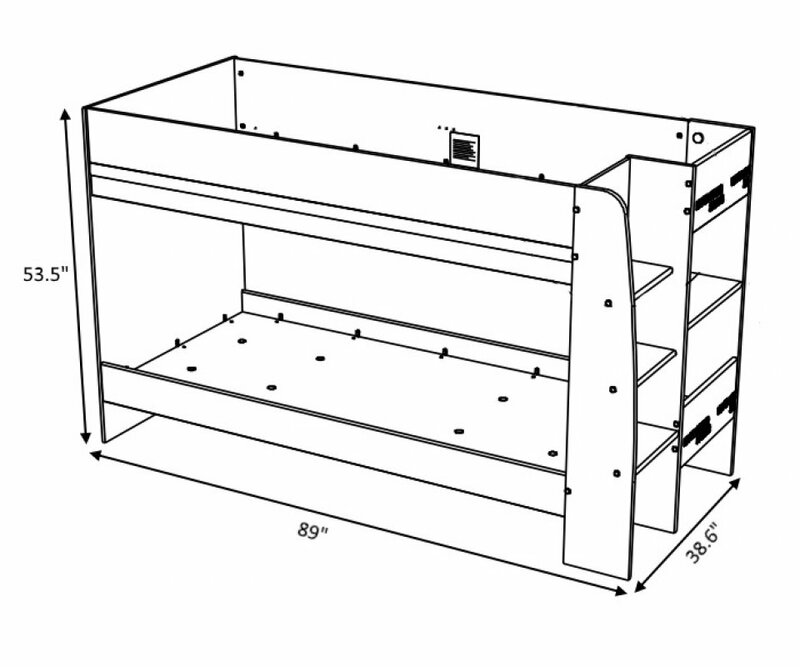 SHELVES WITH ACCESS PORTS: Narrow shelves are parallel to the steps, and have access ports to contain cords for lamps and media devices. 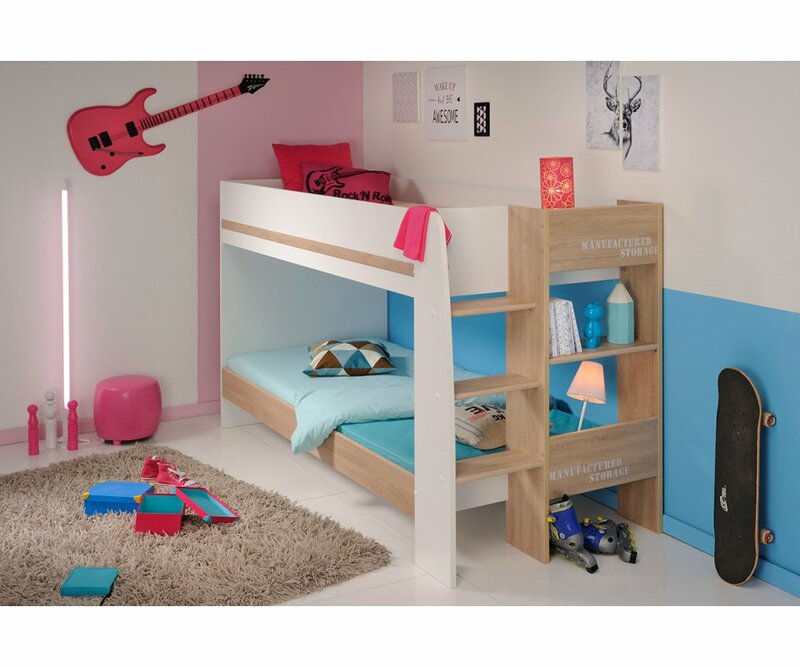 RoomSmart’s Family Bunk Bed has two twin-sized bunk bedframes. The upper frame is surrounded by a safety rail, with sturdy, built-in steps leading from floor to bunk. 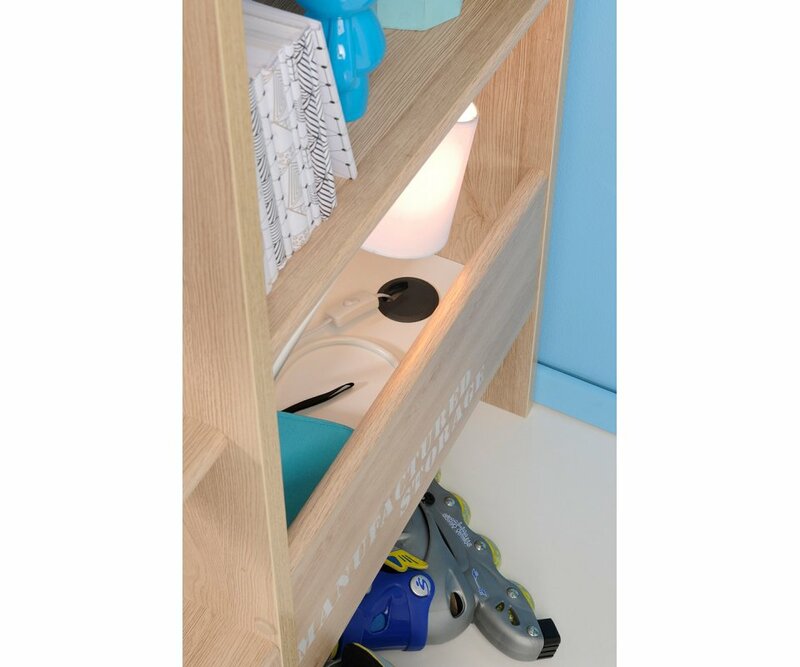 Next to the steps are shelves for books and toys, with access ports that contain cords for lamps and media devices, keeping the wires away from children while they sleep. 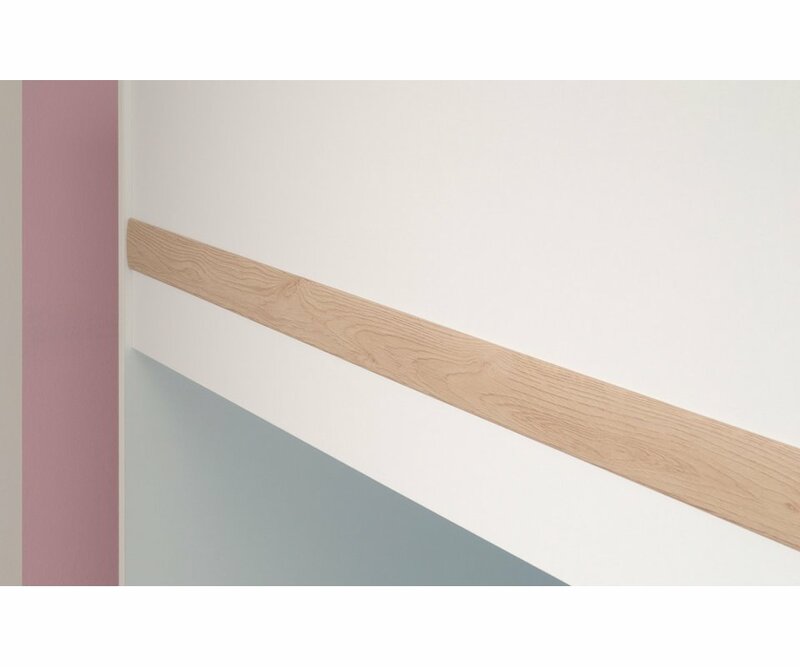 The set is made from high-density MDF boards, and joined with heavy-duty stainless steel hardware, so your beds will be sturdy, without wobbling or sagging. Brooklyn Oak and White veneer finishes add a natural, neutral color element that pairs with most bedroom themes and color schemes. The veneers are designed to resist fading from UV rays, scratches and stains, so they will keep their luster and rich color for years! The industrial-style bunks are accented with white stenciled lettering, a fun design element that kids will love! When you have two beds in the space of one, there’s always room for a friend to sleep over, or for two children to share a room in comfort and style! 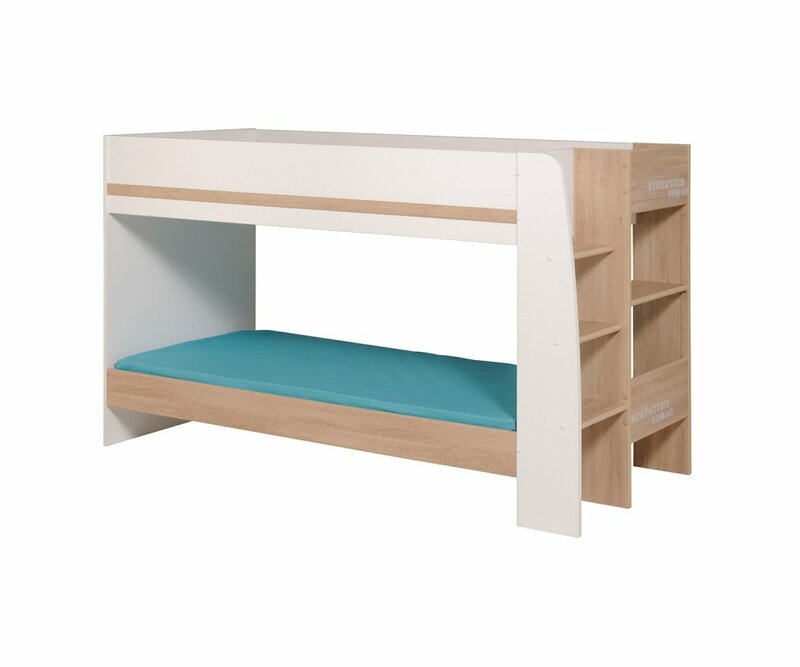 OFFSET BUNK DESIGN: The top bunk is offset from the bottom, providing the bottom with better visibility and adding visual interest and style.HIGH-GRADE PARTICLE BOARD: Solid and sturdy furniture covered with a durable foil finish that withstands the wear and tear of daily life, inc..